Here comes my special on record cleaning machines. In the first part I will present the machines, and write down my impressions on price, handling, and built quality. 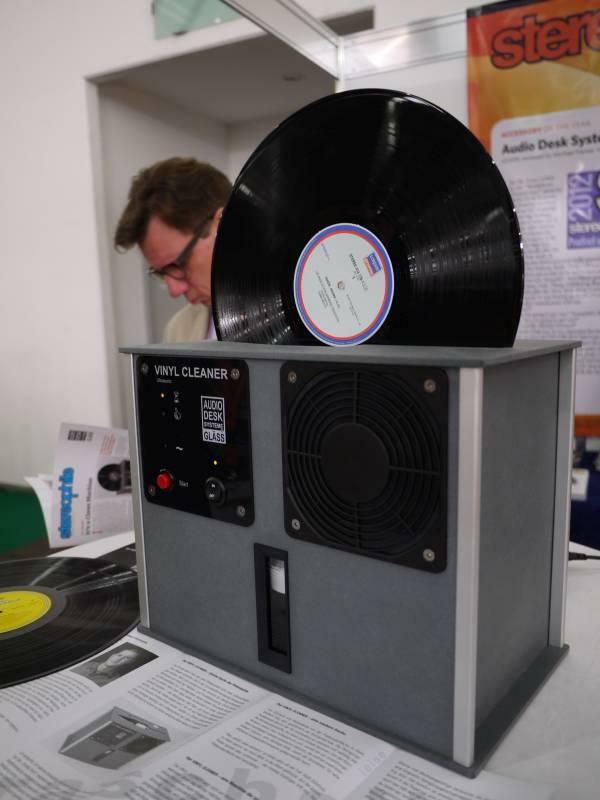 I have cleaned a lot of records on these machines at the show. In the second part I will write on the cleaning results. 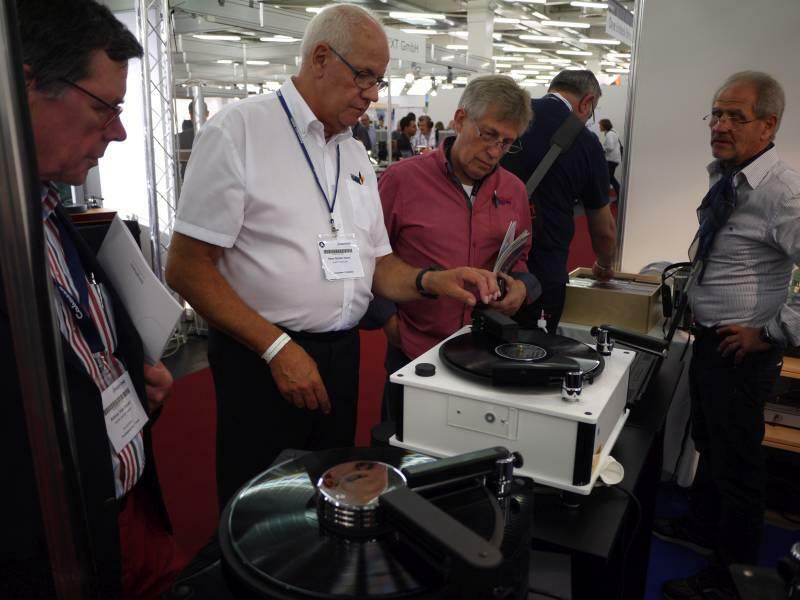 Audiodesksysteme Glaess from Germany was the first to introduce an ultrasonic record cleaning machine to the public. I heard at first from this machine in 2010, and since, there are some others making copies of this machine. This machine takes about 6 minutes for a full cleaning cylcle of both sides. 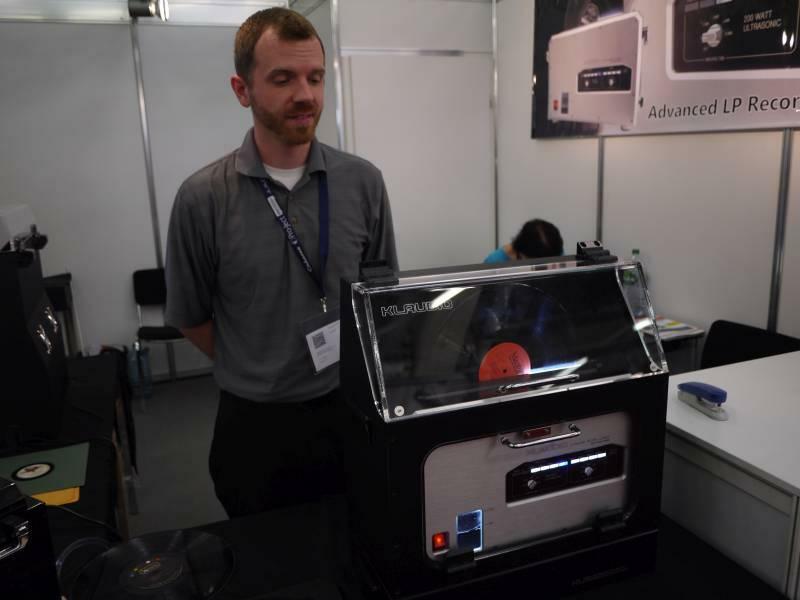 There is just 1 minute of low-power ultrasonic cleaning, and another 5 minutes of drying. You just insert the record and push the red button once (or multiple times for longer cleaner period) and then go for a having a break. When you come back from having your coffee, you have a clean and dry record in your hands. Price in Germany is about 2,300 EUR. 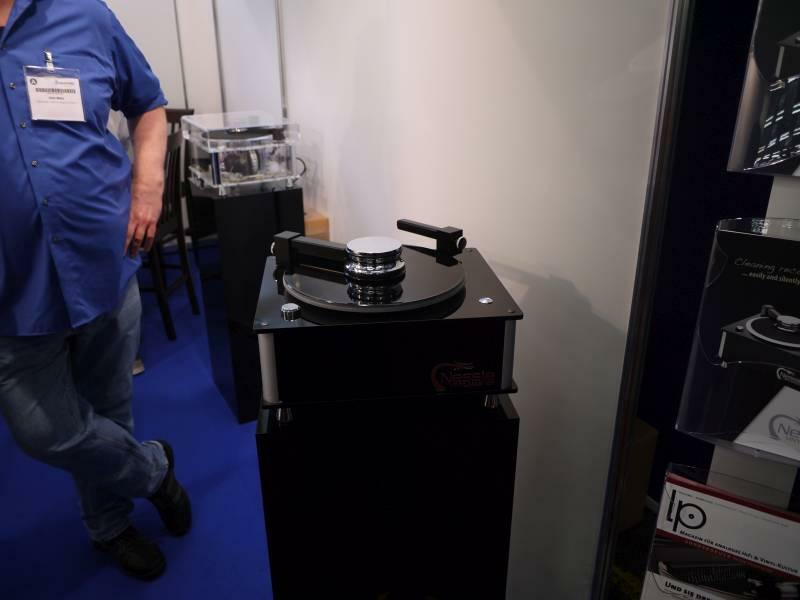 KL Audio from USA got their ultrasonic record on the market this year. It has been designed in USA, but it is produced in Korea. While it looks much sturdier than the Glaess, it costs nearly the double (4000 USD). But since it works with 200 W of ultrasonic power, it creates a lot of awful noise, which you cannot stand when being in the same room, so you have to buy the extra noise damping case (1500 USD). 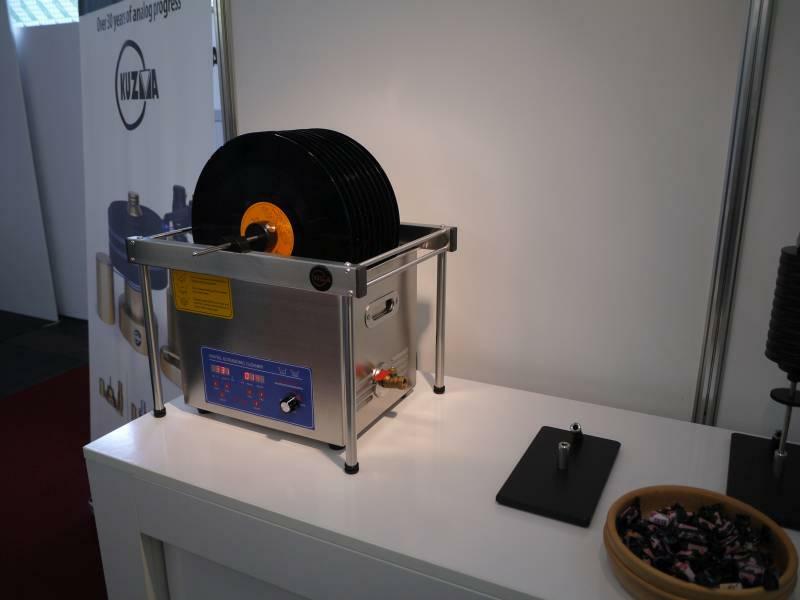 The high ultrasonic power is necessary, because they use just distilled water, while all other record cleaning machines have at least a few drops of wetting agent in their water solution. The whole process last about 10 minutes, with 5 minutes of ultrasonic cleaning and 5 minutes of drying. Handling is about the same as the Glaess, you just place the record in the trough, and push the button. But you also have to open and close the lid of the noise damping case. If you want to clean several records automatically at one time, you need the automatic disk loader (2800 USD). 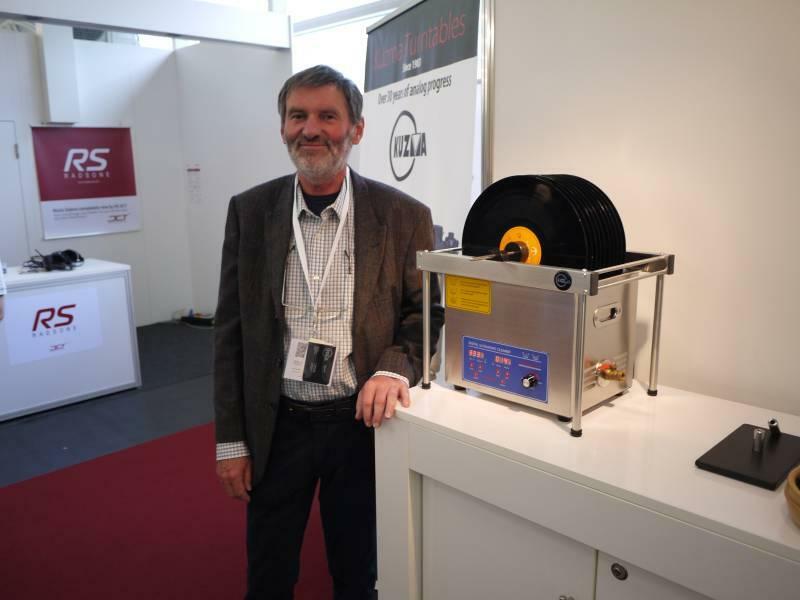 Franc Kuzma from Slowenia showed his "Kuzma RD Ultrasonic Record Cleaning kit", which sells for 1000 EUR retail. 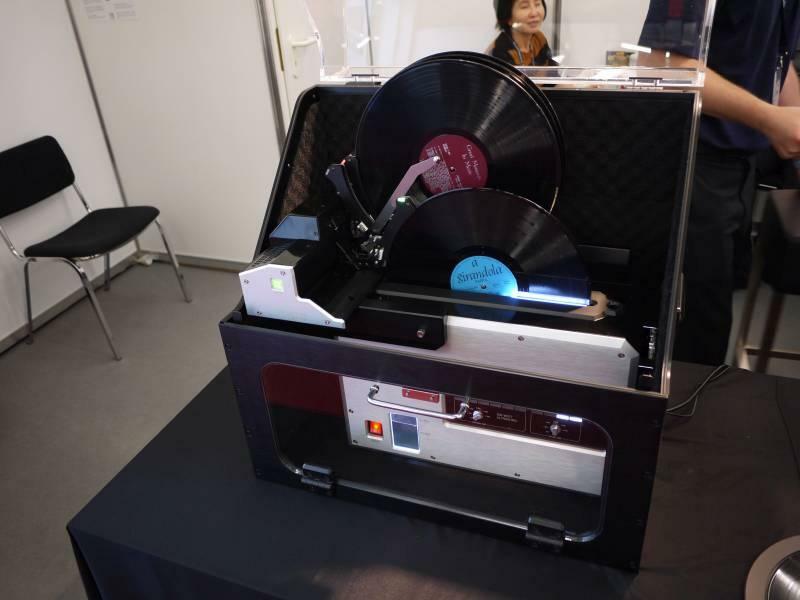 You have to buy the ultrasonic through from ebay or else and assemble you own record cleaning machine. For drying, you just take out the spindle with the records out and let them dry at the air. Kuzma speaks of a cleaning time of 10 minutes, and drying time of 20 minutes. As you can put 10 records at one time on the spindle, the total cleaning time is 30 minutes for 10 records. 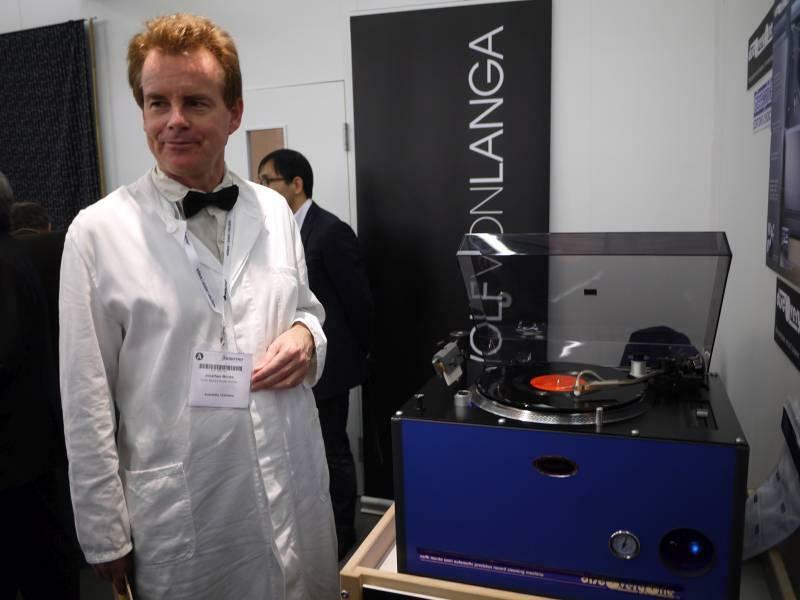 Keith Monks from United Kingdom showed the "New Keith Monks Discovery One Mini Sapphire Record Cleaning Machine", which sells for 2500 EUR retail. Keith Monks is the dinosaur of record cleaning machines. For years, the Keith Monks machine was the holy grail of record cleaning. No this is not Dr. Brown from "Back to Future", this is Mr. Monks himself. There are a lot of manual steps for cleaning and drying the record, and several times Mr. Monks had to adjust some things at the tonearm or the hoses. This really put me off. Indeed, this machine was silent. Hannl from Germany once started started with a non-expensive 600 EUR machine called "Waschbär" (raccoon). Since then, Guenther Hannl is constantly improving his machines. The price range is from 2000 EUR to 3500 EUR. A rotating brush is the newest improvement. According to Mr. Hannl, this brush reaches the same degree of cleaning as ultrasonic machines, thanks to micro-vibrations in the groove. While some manual steps are needed, the usage is straightforward and - surprisingly - as quiet as the Keith Monks. Cleaning both sides of a record takes about 15 minutes. 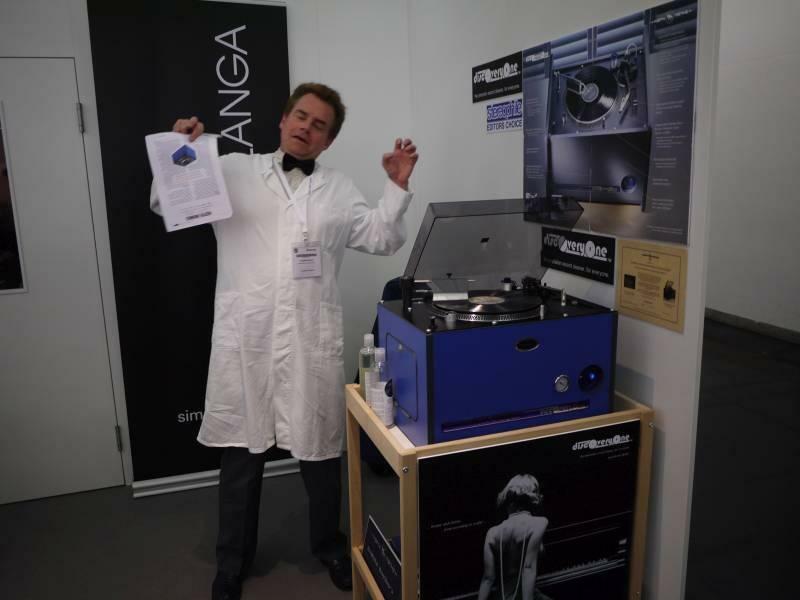 Vinyl Master Nessie from Germany looks very similiar the Hannl, while it misses the rotating brush, it is a one-button operated machine. It retails for 2000 EUR. I cleaned a handful of records at the show. A second part on the sonic differences after cleaning will follow soon.